Climbing Mt. Kinabalu is a 2-day affair, which requires a rest-stop and accommodation. Over the years a peak base-camp has developed at an altitude of 3,333m, which is where all overnight climbers will rest and catch a few hours of sleep before their attempt on the summit. The cluster of accommodations are collectively referred to as Laban Rata, although it actually consists of numerous rest huts used for various purposes, one of which is confusingly called Laban Rata Rest House. Booking through Downbelow you have a choice of 5 of the rest huts, but availability ultimate decides where you will end up. The average temperature at Laban Rata is 22 degrees during a sunny day and 10 degrees at night. It can also feel quite damp so warm dry clothes are a necessity as nothing will dry. Waras Hut is a little 8-man accommodation unit and the first you will encounter when approaching Laban Rata. Unheated with a communal bathroom without hot water, the Waras Hut is basic and purely provides a bed in which to recharge before you tackle the peak. The hut is cold with average temperatures of around 10-14 degrees. Laban Rata Rest House is the biggest and most coveted accommodation as it also hosts the dining area, about 6 minute further along past the Waras Hut. Essential electricity is supplied by small generators and unfortunately hot water for showering and heating during the night is not essential electricity. Only the private rooms are heated. Gunting Lagadan Rest House is the second biggest accommodation facility at Laban Rata and also without heating or hot water, it is now similar to Laban Rata Rest House. The biggest difference is that Gunting Lagadan Rest House is another 7 minute walk further up the mountain. Panar Laban Rest Hut is the last facility we offer. Furthest up the mountain, about a 7 or 8 minute walk from Laban Rata Rest House, lies this little 8-bed unit similar to Waras Hut with an outdoor toilet & shower. We suggest using the showers located in Laban Rata Resthouse for a more acceptable shower ! The Pendant Hut, Mountain Torq’s Mt. Kinabalu HQ is located at 3,270m above sea level mere minute walk away from Laban Rata. The cozy and eco-friendly hut, the design of which was inspired by the Alpine huts of Europe, feature dormitory style rooms, plus 1 private, double room and 1 private dormitory with 4 beds. The hut has easy access to Mountain Torq’s activities and events, plus views of Via Ferrata climbers on the Panar Laban rock face, which towers above the accommodation. 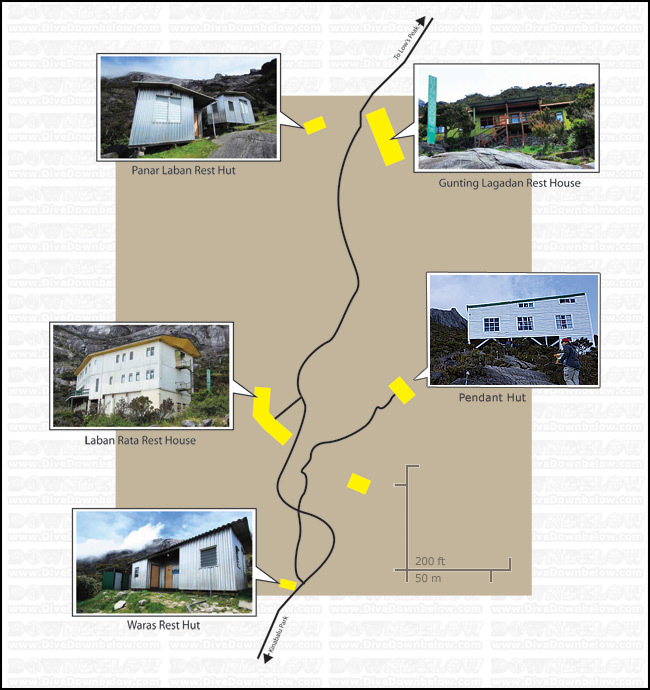 Here’s an overview of the various huts and their relative locations.